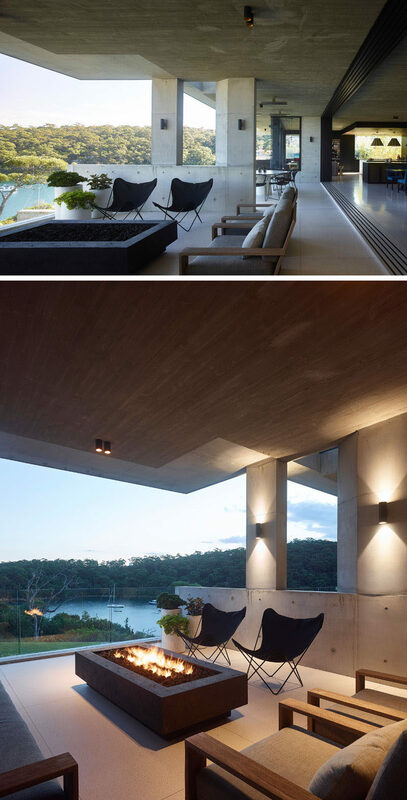 Shaun Lockyer Architects have designed a multi-level house in Sydney, Australia, that’s perched overlooking the harbor below. 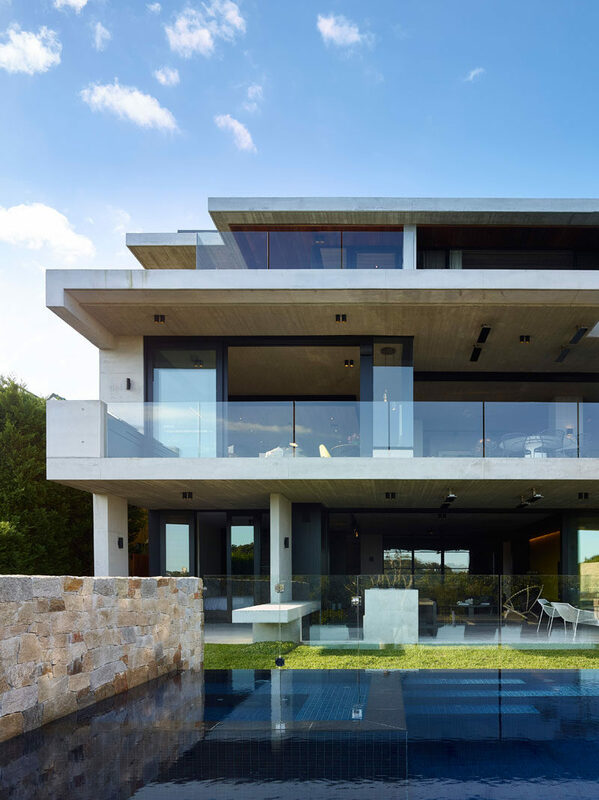 Inspired by ‘Brazilian Modern’, the home features a combination of materials such as concrete, stone, timber, and steel. 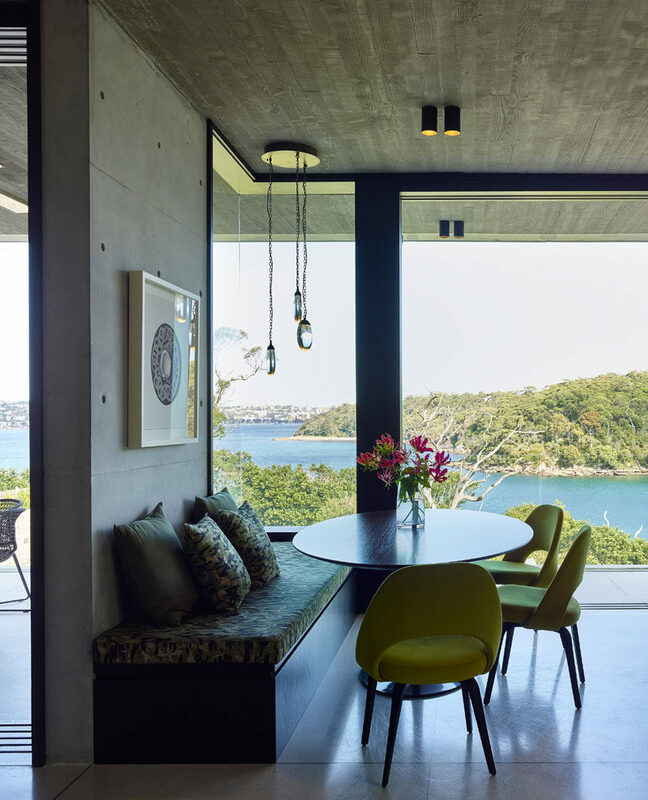 Upon entering the home, there’s a simple red upholstered bench that sits below a highlighted piece of artwork. 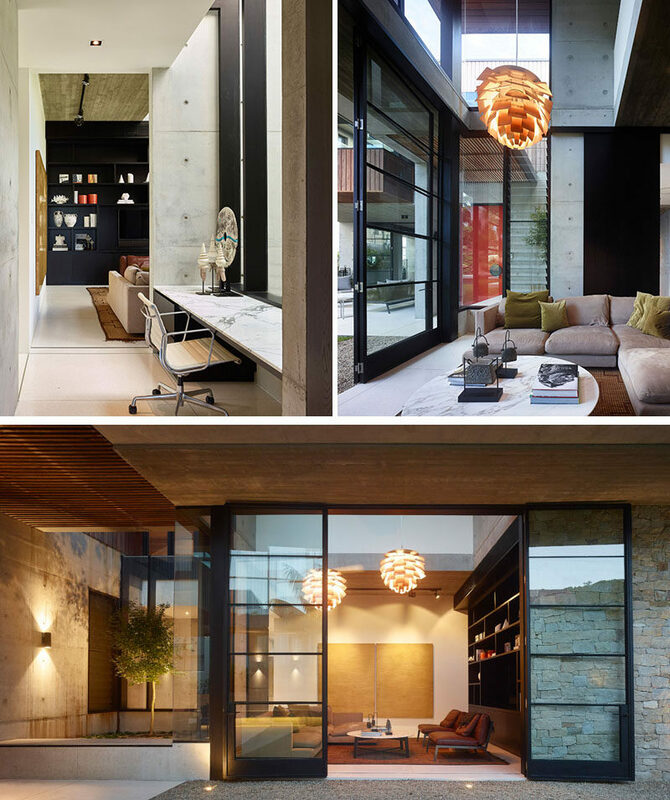 Off to the side of the entryway is a small hallway with a built-in desk area, and a casual living room that opens to the front garden. 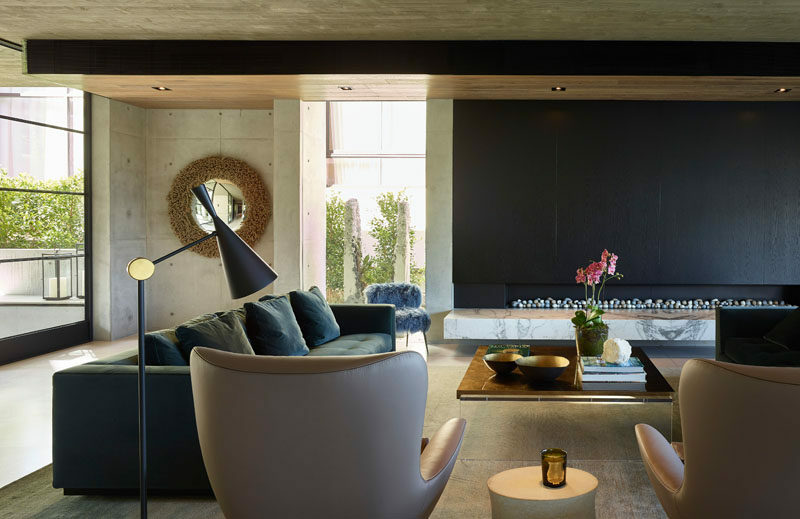 In the main social areas of the house, there’s the more formal living room, with a long fireplace and comfortable seating that surrounds a coffee table. Behind the living room is the dining room. 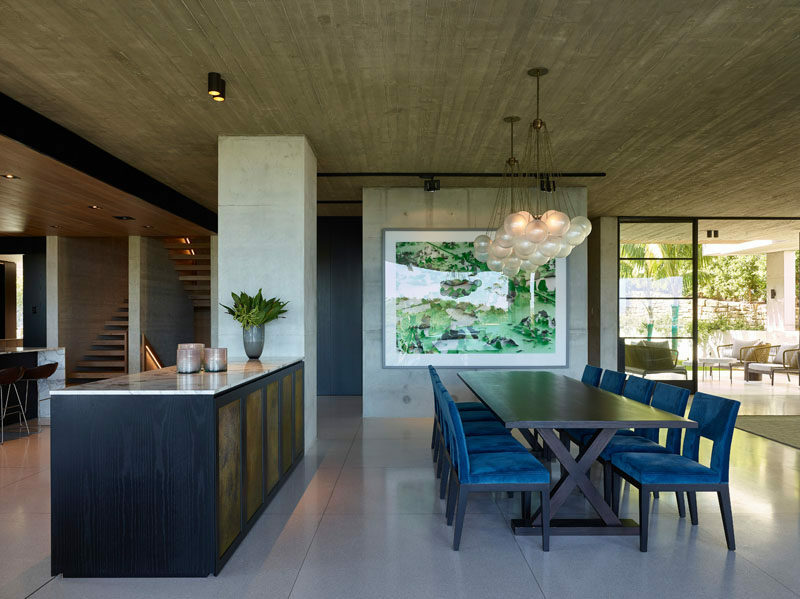 A pair of chandeliers hang above the large dining table, while a sideboard provides separation from the kitchen. In the kitchen, dark wood cabinetry contrasts the light floor and ceiling, while a large picture window provides ample natural light. 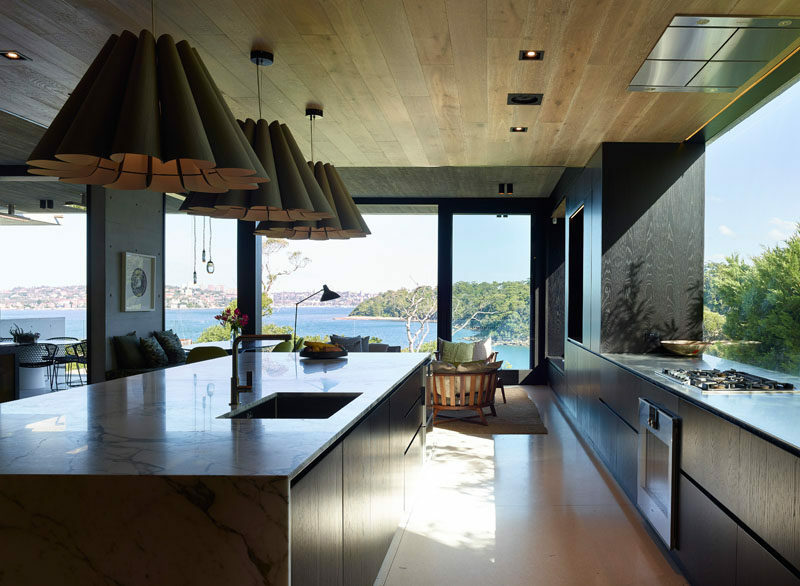 At the end of the kitchen is a casual dining area with a circular dining table. 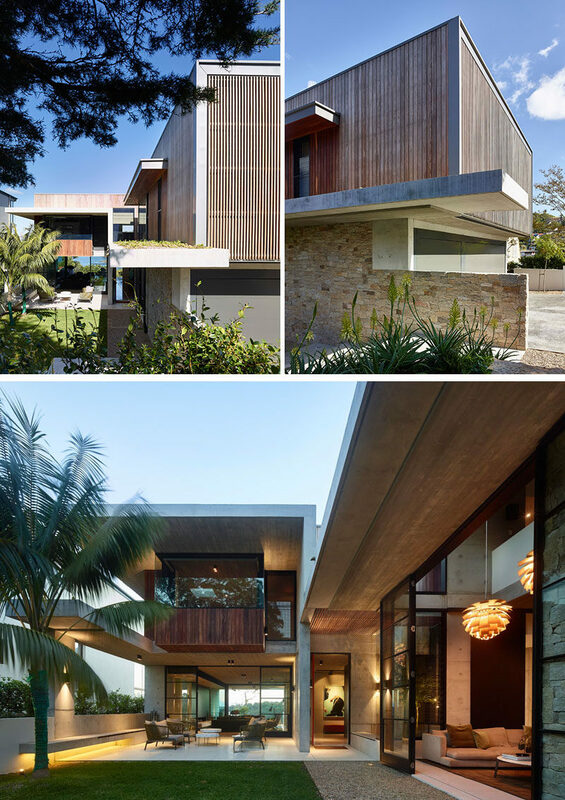 The open plan living and dining area opens up to a balcony, creating an indoor/outdoor living environment. Wood stairs with a matching wood handrail connect the various floors of the home. 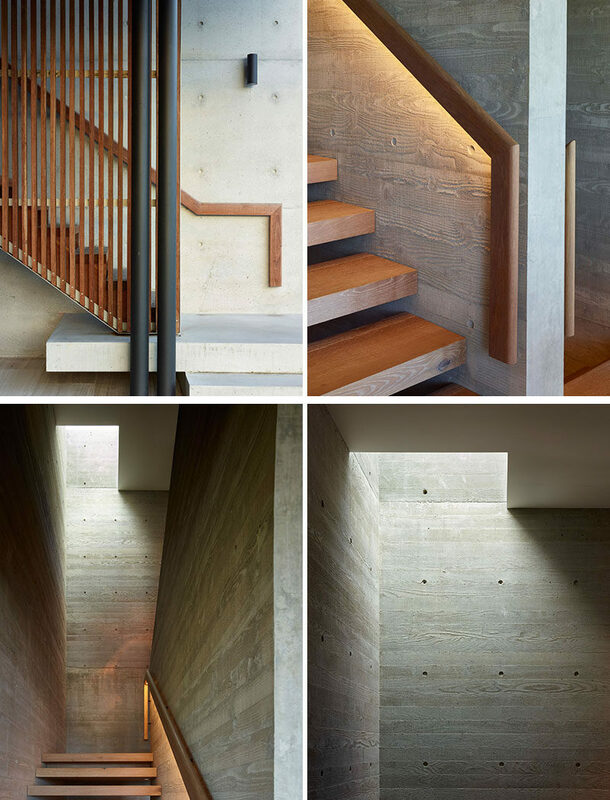 At night, hidden lighting can be turned on to highlight the handrail, while board-formed concrete provides an interesting wall texture. 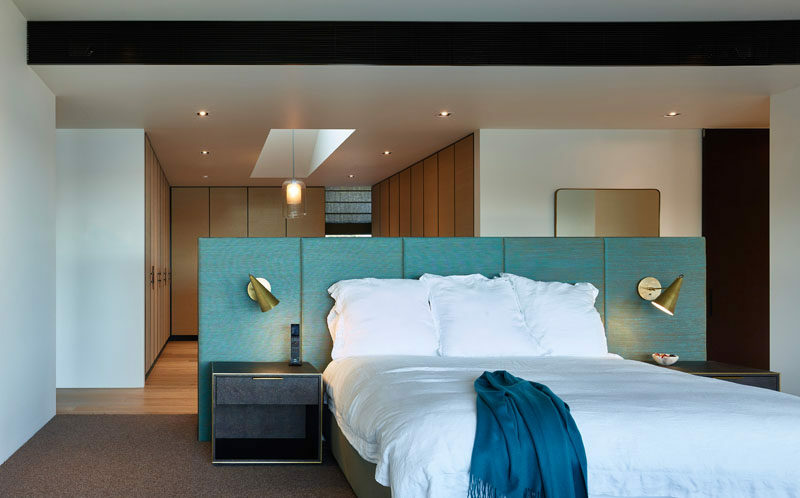 In the master bedroom, the headboard provides separation from the dressing area, and allows the bed to be positioned in the middle of the room to take advantage of the views. 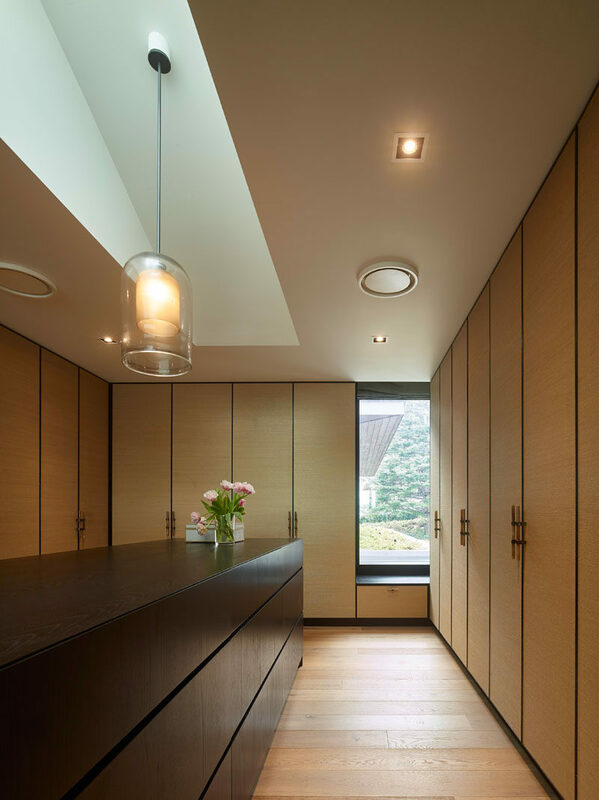 The dressing room features floor-to-ceiling cabinets with a central dark wood dresser. 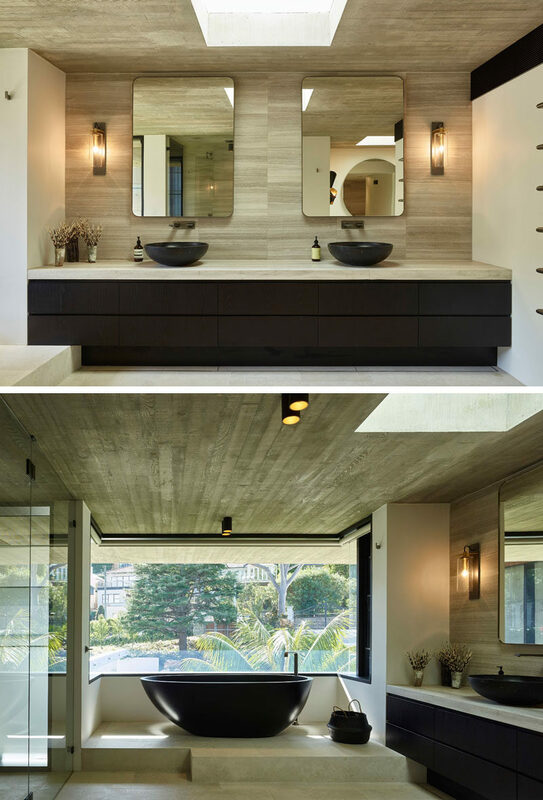 In the master bathroom, there’s a dual sink vanity that runs the length of the wall, while a freestanding bathtub is raised up onto a platform to take advantage of the views. Blinds can be lowered when privacy is needed. 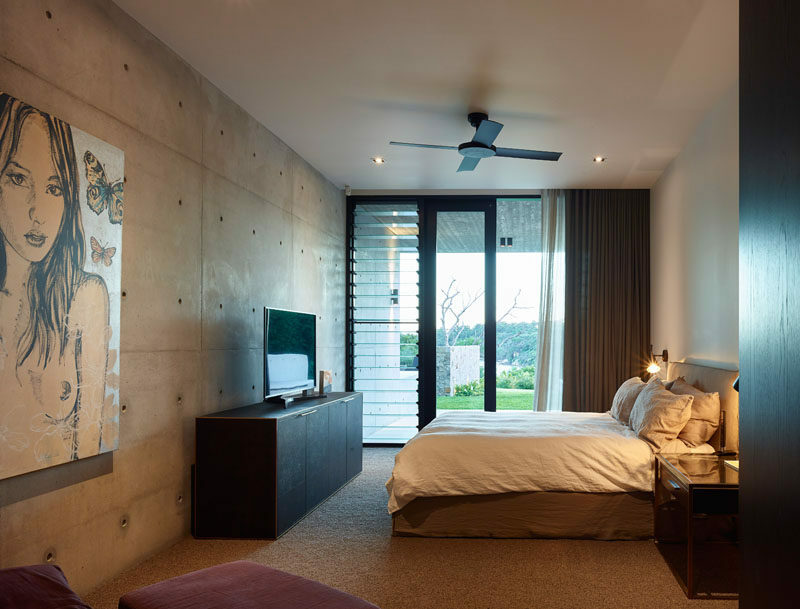 In another bedroom, a concrete wall has been paired with white smooth walls for a modern appearance. 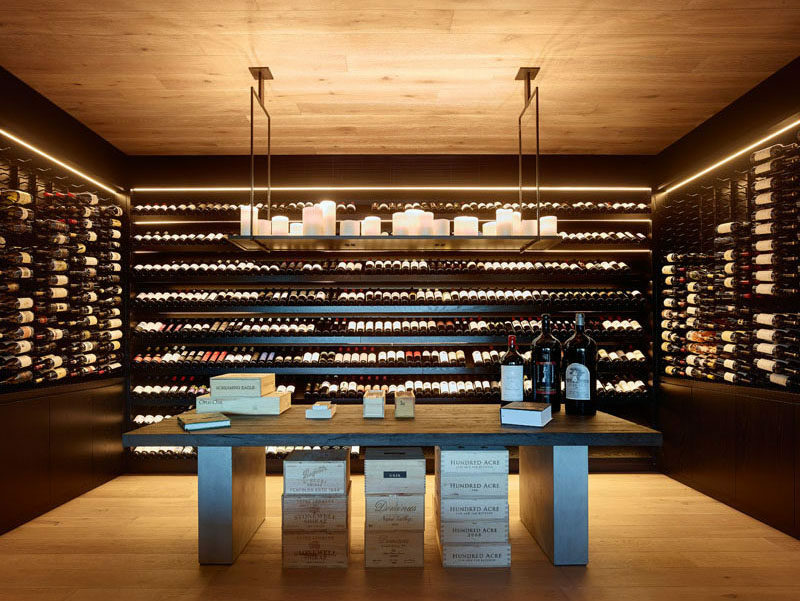 On the lowest floor of the house, there’s a dedicated wine cellar with a table and plenty of storage. 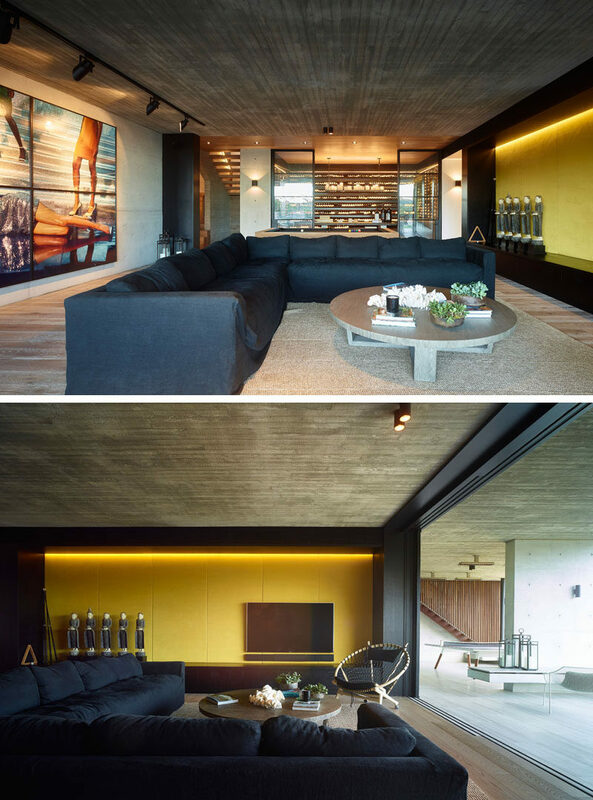 The wine cellar is located off a living room that features a large comfortable couch, while artwork covers the wall, and a yellow accent wall with hidden lighting helps to brighten the space. The lowest level of the home opens up to a covered patio area and the backyard that features a swimming pool.